Welcome to Las Vegas! 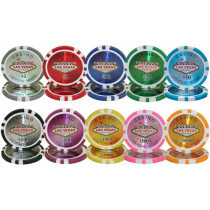 These clay composite poker chips feature a laser graphic design that has been very popular. The sparkling inlay depicts the classic Las Vegas sign with the denomination written just below the sign. Bring these chips out for your next home game and let everyone know they're in for a true Vegas casino night.